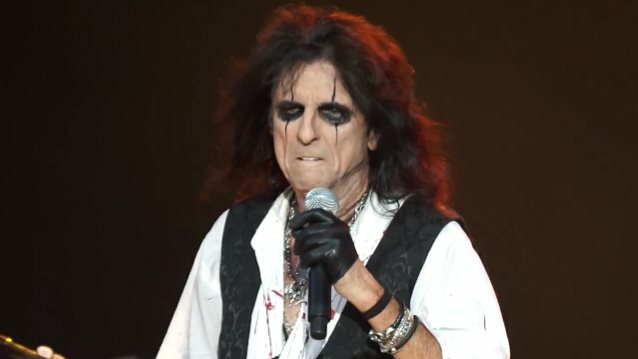 HOLLYWOOD VAMPIRES played their first show since Joe Perry's recent health scare Tuesday night (July 12) at Fraze Pavillion in Kettering, Ohio. Fan-filmed video footage of the concert can be seen below. The AEROSMITH guitarist, who did not perform with the VAMPIRES in Kettering, is said to be stable condition after being forced to leave the stage Sunday (July 10) while playing a cover of SPIRIT's "I Got A Line On You" with HOLLYWOOD VAMPIRES during their Brooklyn gig at the Coney Island Amphitheater. HOLLYWOOD VAMPIRES canceled Monday night's scheduled performance on "The Late Show With Stephen Colbert", but is expected to play the remaining dates on its summer U.S. tour, which hits Mt. Pleasant, Michigan on Wednesday. The exact nature of Perry's illness has not been revealed, although unconfirmed reports suggest the 65-year-old rocker suffered a heart attack. Joining Perry, Alice Cooper and actor Johnny Depp in the HOLLYWOOD VAMPIRES are their rock-star musician friends Matt Sorum (GUNS N' ROSES, THE CULT) on drums, Robert DeLeo (STONE TEMPLE PILOTS) on bass, Tommy Henriksen (ALICE COOPER) on guitar, and Bruce Witkin (THE KIDS) on piano, percussion and guitar.